In 2016 I received a grant for public art for the newly renovated Boston Public Library Jamaica Plain branch. I was one of three artists who were so honored to have their work displayed permanently in the public space. As a resident of the neighborhood, and a frequent visitor of the library, I chose to base my art on the neighborhood that I had grown to love in the years I had lived there. I created a sequence of images that depict a human element against a backdrop of an iconic architectural feature of the South/Centre Street area of Jamaica Plain. In combination, the intended effect was to capture the visual experience of a “stroll” through our unique neighborhood. Each monoprint of the triptych was generated using printmaking techniques such as woodblock and chine collé on paper, printed on mulberry paper, and mounted on wooden panels measuring 18″ by 24″. These works are the largest I have worked on and were printed by hand using a baren. “Neighborhood Kaleidoscope” can be seen at BPL – Jamaica Plain branch, 30 South Street, Jamaica Plain 02130. In 2015 Nordic Jazz, a group that had been performing around the Boston area for years, put out its first CD, fronted by singer (and friend) Anna-Frida Abrahamsson. I was commissioned to create the artwork for the cover. I created the print matrix using a technique called organza collagraph, and sometimes silk mezzotint. For the base, I used a piece of mat board that had been sealed with gesso. A piece of organza material was then adhered to the surface using a mix of acrylic medium and water. The pores in the fabric create a black screen when printed. The image is built up by applying acrylic gloss medium in layers, gradually creating grey tones and white areas. With this method, one is working from dark to light. The image was drawn onto paper and transferred to the surface of the plate. I mixed a little paint with the acrylic mixture so I could see the detail I was painting and the layering of color. “Gentle Old River” by Nordic Jazz is available for listening on Spotify. November is a busy month for me! I am participating in a new show curated by Assistant Gallery Director Alex Kittle at UFORGE Gallery in Jamaica Plain. See press release below by Alex Kittle. 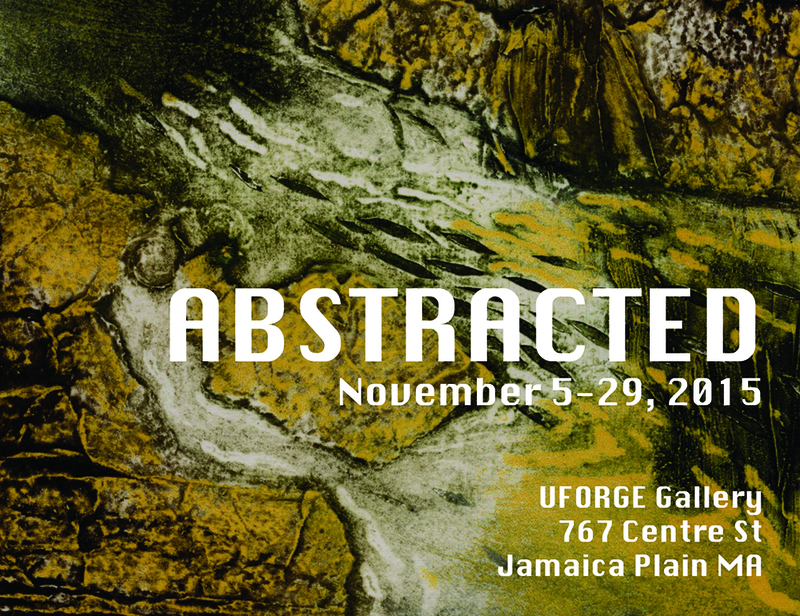 “Abstracted” at UFORGE Gallery BOSTON, MA – UFORGE Gallery presents a special invitational exhibition focusing on abstraction in different media. For most art lovers, the word “abstraction” conjures up images of Jackson Pollock’s drip paintings and Mark Rothko’s flat color fields, or perhaps the lively compositions of Wassily Kandinsky or the minimalist squares of Piet Mondrian. To most, abstraction means a lack of representation, a vision of lines and shapes with no connection to reality. But the concept is in fact much more elastic, especially when used as a verb. Real­world subjects can become abstracted through various artistic techniques­­cutting, flattening, deconstruction, merging, twisting, and obfuscation, to name a few. Collagists may piece together a composition from disparate elements, or to chop up familiar images into something new. Watercolorists may take a sunset or ocean view and blur it into something almost unrecognizable. Assemblage artists and photographers may combine ordinary objects into unexpected figurations, removing the context that we usually associate with them. Painters may take organic forms and transform them into fantastical shapes or strange compositions. All this and more can be found in “Abstracted,” a special exhibition curated by UFORGE Assistant Gallery Director Alex Kittle, who brought together a range of local artists working within abstract modes, looking for works that warped reality in some way or presented non­objective forms. The exhibition is on view from November 5th through November 29th, 2015, with a reception to be held on Friday, November 6th from 6­830 PM. I am participating in a new exhibit at UFORGE Gallery in Jamaica Plain. Stop by tonight and check out the amazing group of artists and their work in Wanderlust! The opening reception is tonight, and the show will run through July 19th. In the early twentieth century world travel was a glamorous but ever­more accessible possibility, with the development of enormous cruise ships, automotives, and eventually passenger planes. Designers created numerous posters advertising new destinations, from Alpine ski slopes and Alaskan glaciers to Greek ruins and Palestinian architecture. Today, these posters have developed a following of their own, admired for their Art Deco­inspired styles, their playful typography, and their depiction of exciting faraway places. For this exhibition, UFORGE Gallery invited its members, staff, and selected artists to each create their own take on the classic travel poster, with the only requirement being that each piece measures 16×20”. Artists responded with their own individual styles and interpretations: some working in traditional paints, others experimenting with digital techniques and mixed media; some representing actual destinations, and others pulling from fictional locations or their own imaginations. Exhibited together, their works will transport viewers to all manner of wonderful places, and perhaps inspire a bit of real­life wanderlust. Exhibiting artists: Quenby Bucklaew, Miles Donovan, Yo Ahn Han, Amy Hitchcock, Debra Jayne, Dinora Justice, Alex Kittle, Kristi Lyn, Christine Ledoux, Liliana Marquez, Anne McCaffrey, Heather M. Morris, Erica Nazzaro, Cristina Rosa Nelson, Tamara Rohrer, Steve Sangapore, On Kyeong Seong, and Shaanti Williams. “Wanderlust” is on view from June 4th through July 19th, 2015, with a reception to be held on Thursday, June 4th from 6­8 PM. Founded in 2011, UFORGE Gallery is committed to showing both professional and emerging contemporary artists in a fun, inclusive environment. Their innovative exhibits feature a range of artwork in different media, and their membership collective offers new opportunities for artists to move ahead in their careers. The gallery also hosts the Mr. Hip Presents: Reading Series and Sip & Dip paint classes. They are located at 767 Centre St in Jamaica Plain, MA. Hours are 530­8pm, Thursday­Friday, and 12­6pm, Saturday­Sunday. The Arcana exhibit at Uforge Gallery in Jamaica Plain, Massachusetts will be going on until the end of January. To support the exhibit, the gallery is offering limited edition prints of the works in the show for sale from their website. Check out the online gallery here. The gallery is open Thursday and Friday evenings, and Saturday and Sunday during the day until 6:00 p.m. The gallery will be accepting orders until the end of February. The Arcana exhibit is now open at Uforge Gallery in Jamaica Plain. We had a wonderful reception and many people came out to see the show despite the cold. Developed in the fifteenth century for various card games, the tarot deck has become known for its use in divination, drawing from ancient Egyptian and hermetic wisdom. 78 cards reveal weighty symbols like pentacles, swords, crowns, cups, suns, and moons, with regal and mythological figures representing love, death, enlightenment, strength, justice, and other aspects of the human experience. Tarot readers interpret patterns of randomly-drawn cards, relating to the subject’s innermost thoughts and desires, their past struggles, their future triumphs. Inspired by this iconic yet mysterious imagery, UFORGE Gallery called on its members, staff, and other local artists to create their own original tarot art. Each artist was given a card and a 16” x 28” wooden board, a uniform blank slate on which to work in whatever medium they preferred. They were challenged to create something new while working within certain limitations, encouraged to bring their unique aesthetics to the familiar forms of Tarot. The result is a collection of designs ranging from the weird to the traditional, mixing together modern and classical references, stylistic experiments, and transformative materials. Exhibiting artists: Janella Boudoin, Quenby Bucklaew, Brian Crete, Eowyn Evans, James Flynn, Amy Hitchcock, Marnie Jain, Alexandra Jordankova, Alex Kittle, Christine Ledoux, Kristi Lyn, Liliana Marquez, Anne McCaffrey, Heather Morris, Erica Nazzaro, Cristina Rosa Nelson, Nancy Rodriquez, Tamara Rohrer, Steve Sangapore, On Keong Seong, Ian Tartasky, and Shaanti Williams. “Arcana” is on view from January 8th through February 1st, 2015, with a reception to be held on Friday, January 9th from 630-9 PM. Founded in 2011, UFORGE Gallery is committed to showing both professional and emerging contemporary artists in a fun, inclusive environment. Their innovative exhibits feature a range of artwork in different media, and their membership collective and professional service programs offer new opportunities for artists to move ahead in their careers. The gallery also hosts the popular Mr. Hip Presents: Reading Series and Figure 1 Drawing Group with Zombie Romance. They are located at 767 Centre St in Jamaica Plain, MA. Hours are 5-8pm, Thursday-Friday, and 12-6pm, Saturday-Sunday. Journeys has ended at Uforge Gallery, but the work is still present in the December popup Holiday Shoppe running through December 24th. Please stop by and check out the loads of artwork and craft items made by local artists. The hours have been expanded for the holiday month. I also have work at The Hallway Gallery, located on South Street in Jamaica Plain. Sadly, this will be the final show for the gallery which will close at the end of month. The owner has put together a show of artists who have shown at the gallery over the years for an eclectic show called Happy Ending.